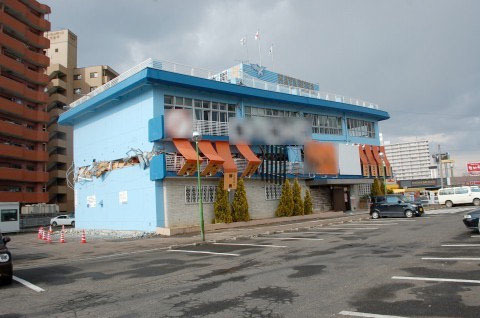 Damage to a building in Sendai caused by the March 11 earthquake. 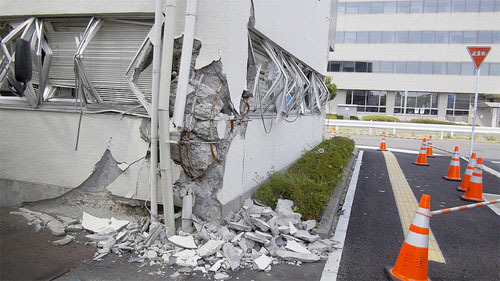 Japan is a seismically active country and has some of the most rigorous earthquake building standards in the World. Although building codes are updated regularly, a major change to the building standards act occurred in 1981. Buildings built to the pre-1981 standard are called “kyu-taishin” and buildings built to the new standard are called “shin-taishin“. This is a very important distinction to many Japanese looking to purchase an apartment. 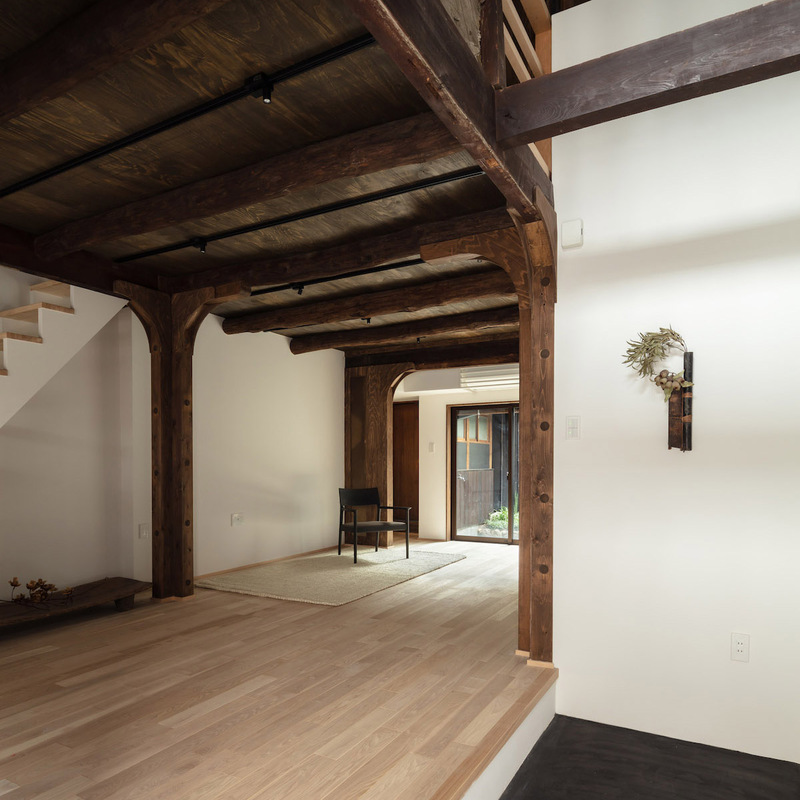 The recent Magnitude 9 Tohoku earthquake has brought earthquake building codes to the forefront of many buyers’ minds. Demand for shin-taishin buildings is expected to rise. – 1924: Earthquake resistant construction regulations were introduced. After the 1891 Mino-Owari magnitude 8 earthquake, research and study into earthquake resistant construction began. The 1923 Kanto earthquake further hastened the introduction of building regulations. The regulations required a minimum thickness for wooden beams, reinforced concrete to have an earthquake load and braces to be installed. However, these rules only applied in town areas. – 1950: The introduction of the Building Standards Act and what is now known as “kyu-taishin”. The change was brought about after the 1948 Fukui earthquake which had a magnitude of 7.1. Earthquake resistant design was enforced nationwide and no longer limited to just town areas. A certain amount of earthquake load bearing walls were required. Extra framework was required for wooden structures. However, no standards were enforced in the event of a larger earthquake that produced a seismic intensity of 6 or higher. A seriously damaged building in Sendai following the 2011 Tohoku Earthquake. The seismic intensity scale in Sendai City was lower to upper 6. -> 1971: Amendments to the Act for shearing reinforcement and reinforced concrete foundations. Wooden structures must have reinforced concrete foundations. 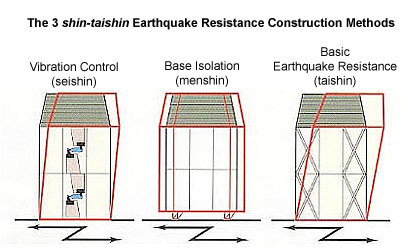 -> 1981: The “shin-taishin”, or New Earthquake Resistant Building Standard Amendment. -> 2000: Revision to improve earthquake resistance for wooden structures. Prior to building a wooden framed house, the ground must be tested for stability and the structure above must be built to suit the ground type. Extra regulations applied to braces, foundations and beams of the structure. -> 2000: Introduction of the 10-Year Warranty Against Defects. New houses must include a 10 year warranty against defects. -> 2006: Building certificates and inspections became stricter. This amendment was made after the forged earthquake resistance data scandal by Aneha in 2005. Buildings above a certain height were subjected to peer reviews. Apartment buildings over 3 stories now require inspections in the middle of the construction process. 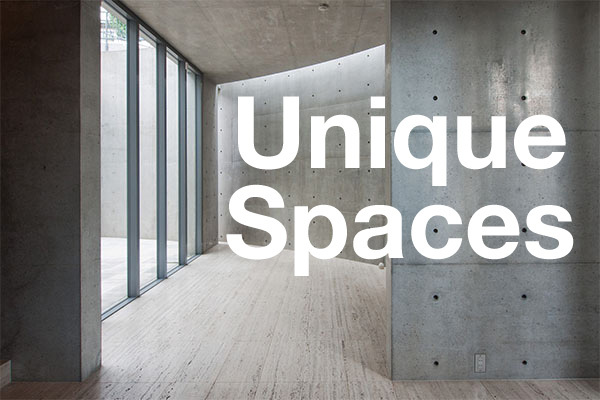 Under the kyu-taishin building codes, a building is designed to withstand and not collapse with a seismic intensity scale (Shindo-scale) of upper 5, although some damage may be sustained. To put that in perspective, the 1923 Great Kanto Quake and the 2011 Tohoku Earthquake produced a Shindo-scale of upper 5 for Tokyo. The Tokai Earthquake, which is long overdue, is expected to have a seismic intensity level of upper 5 for Tokyo. The Tohoku Earthquake produced a Shindo-scale of lower to upper 6 for Sendai City. Several kyu-taishin buildings in Sendai suffered serious damage as the seismic intensity exceeded what the buildings were designed for. A collapsed building in Sendai City following the 2011 Tohoku Earthquake. 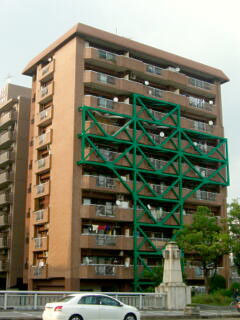 A building with exterior earthquake retrofitting in Nagoya. There are approximately 22,659 kyu-taishin buildings in Japan. This is about 20% ~ 30% of the total number of buildings nationwide. 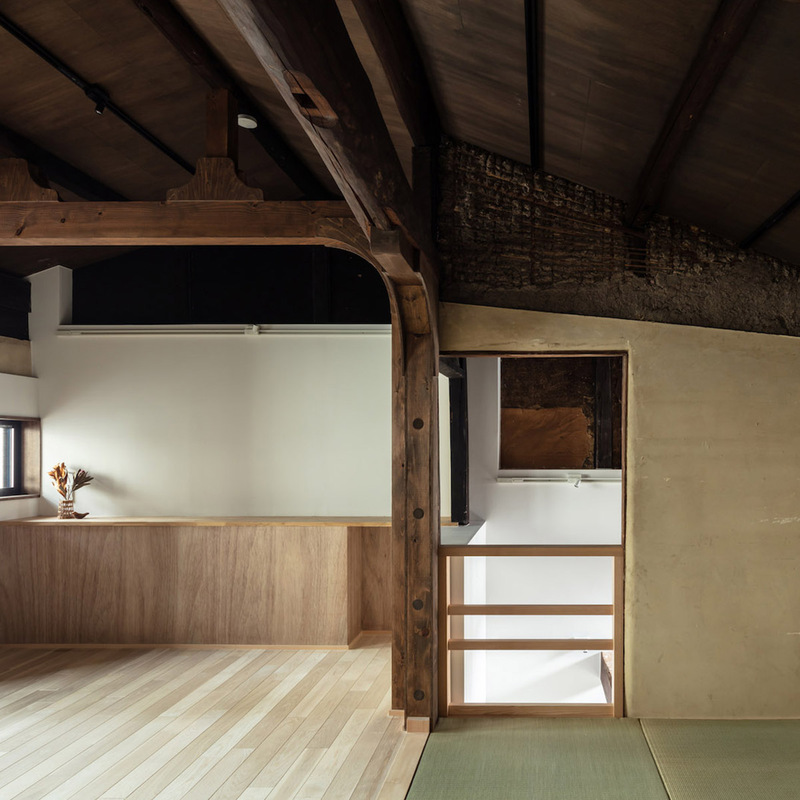 These buildings are still livable and tend to be priced lower than shin-taishin buildings. Some buildings have undergone an analysis (taishin-shindan) to compare the structure to the current building methods. Older buildings may be retrofitted to bring them up to code, but can be costly. The cost for this work is taken out of the building repair fund, but if the funds are insufficient, then apartment owners will be forced to bear the extra costs. Obtaining agreement from apartment owners for expensive work is not an easy process. 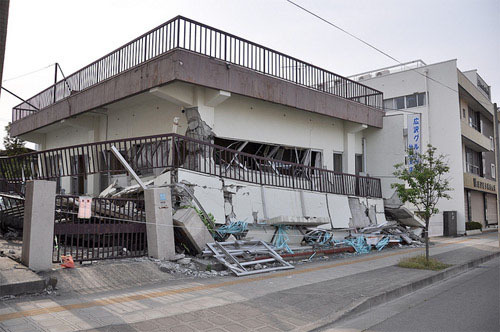 Due to the 2011 earthquake, experts were predicting that monthly repair fund fees for kyu-taishin buildings would need rise in order to carry out extra earthquake strengthening work. Shin-taishin is the name for the construction method amendments introduced in 1981. In the 1995 Hanshin Earthquake, only 0.3% of the shin-taishin buildings suffered serious damage, while 8.4% of the kyu-taishin buildings suffered serious damage. If a building is built to the new code, it will have a building certificate. 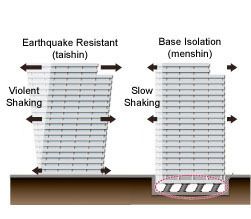 Taishin – the basic earthquake resistance required by law. Beams, pillars and walls are thicker to provide more strength against earthquakes. Because there is no dampening system, the building structure takes the brute force of the earthquake. Shaking feels more violent to occupants of the building. It is easier for damage to be caused to walls and furniture inside an apartment. The higher the floor, the higher the degree of shaking. Repeated earthquakes may eventually lead to serious damage. After a large earthquake (magnitude 7 or above), the building may require large scale repairs or additional reinforcing. There is also a risk that the damage may not be repairable. This method is suitable for low-rise buildings. This is optional and not required by the law, but is recommend for high-rise buildings. Dampers absorb some of the energy of the earthquake and reduce the shaking by some degree. This is more expensive than the regular method but less expensive than menshin (base isolation). Menshin – base isolation system. This is optional and not required by the law. It is the most expensive method but is also considered to be the safest. The building structure is isolated from the ground. The result is a reduction in the force of the shaking – it is much slower and gentler, but may result in a feeling of seasickness. This construction method is often used in skyscrapers and high-rise apartments. Bliss Beige Jingumae is constructed in this way. The entire building is on a base which is not attached to the surrounding blocks of land.This meant they could use very decorative and delicate hanchiku plasterwork in the lobby which can rarely be used in such applications. The biggest and most well-known scandal to date was forgery of construction data by architect Hidetsugu Aneha. Hotels and apartment buildings built well below the minimum building standards. Properties built with falsified data were at risk of collapsing in an earthquake with a seismic intensity of upper 5. This included many of the “Grand Stage” series of apartments. Many of the buildings have since been demolished. Wikipedia has a page about architectural forgery in Japan. Sumitomo has also been in the news when a condominium in Sapporo did not meet building standards. 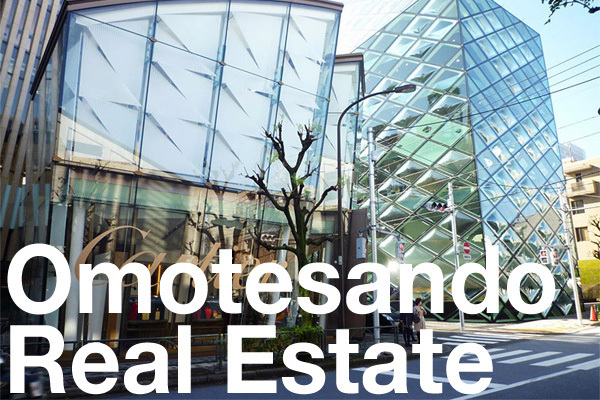 Sumitomo Realty & Development Co was ordered to return about 370 million yen to 14 people who bought 11 units in a defective condominium building in Sapporo, Hokkaido. The contracts were invalid as both the seller and buyers misunderstood that the building was constructed based on the Building Standards Act. The company had claimed that the building, whose earthquake-resistance strength was 86% of the standards, could be reinforced through additional construction and the data were not so faulty as to annul the sales contracts. Kyodo News, May 27, 2011. To both developers and buyers, earthquake resistance is a matter of cost vs. safety. To a buyer, if size is a priority then a pre-1981 apartment will usually be cheaper per square meter. If safety is a priority, then the buyer may have to sacrifice size for safety. There may be cases where a building built before 1981 may be just as strong as one built to the newer building codes. There are also cases, as explained above with Aneha and Sumitomo, where a new building may not be built up to code. Even if a building was completed in 1982 it may not necessarily be built to the new codes, especially if construction began many years prior. 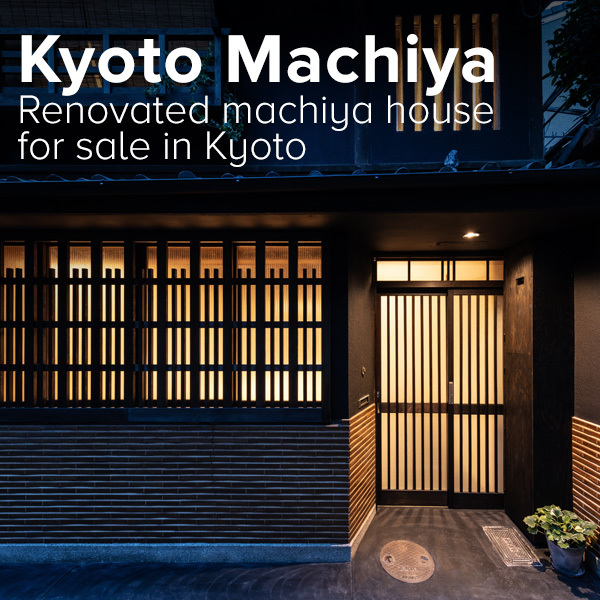 If you are concerned, ask the seller or real estate agent to confirm whether the building is kyu-taishin or shin-taishin. Many of the changes to the building standards act over the years were made after significant earthquakes, so we may see some additional amendments introduced in the future.